Catch these fiercely guarded queens for a crunchy, caviar-flavored snack. It’s hard to ignore the proportions of these delicacies. 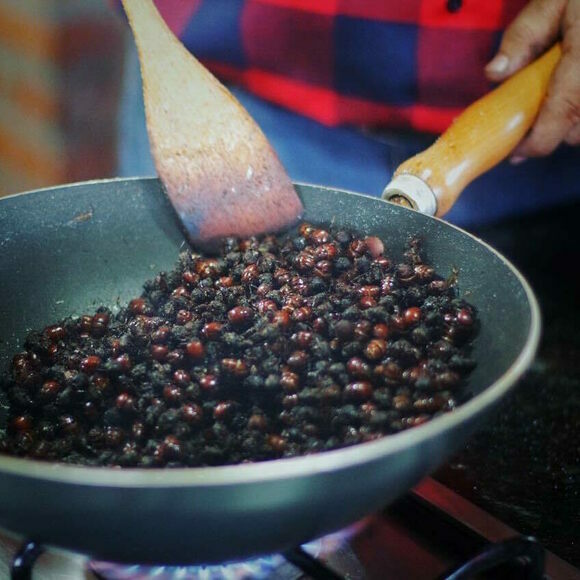 Large as a cockroach and curvy as a pin-up, the “big-bottomed ant” (known as siqui sapa in Peru and hormiga culona in Colombia) is coveted by gourmands around the world, but they’re not so simple to procure. The big-bottomed ants that make good eating are a domineering, all-female squad. They live up to twenty feet underground and are protected by a rigid caste system. Worker ants build the anthill, soldier ants defend it. The princesses, as the females are known, are tasked solely with reproduction. After mating, they fly off to start a new anthill where they’ll become queen. This is when hunters make their move. If they can get past the guard ants, who attack with bites that draw blood, they will be rewarded with females that fetch $9 a pound during peak season and up to $40 when supplies are scarce. In South America, the bugs are soaked in salted water, roasted, and eaten like peanuts. At first the flavor is reminiscent of pork rinds, but it quickly evolves into something more earthy and bitter. They are sometimes compared to caviar, which seems an unlikely match until you realize their “butts” are so well endowed because they’re swollen with eggs. International demand for these bodacious bugs keeps prices high. In the United Kingdom, Harrods sells half a dozen ants dipped in Belgian chocolate for $8. You can find big-bottomed ants in markets in the Amazon regions of Peru or the Colombian region of Santander. In Peru, vendors in the main square in the city of Tarapoto sell small bags of the ants for just a few soles.